Boost the power of mindfulness by making it fun and entertaining for kids! Learning verbal mindfulness strategies can be difficult for children and adolescents, let alone when kids have autism, anxiety, ADHD or other emotional regulation issues. 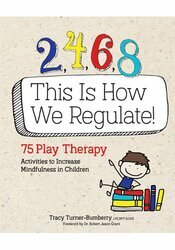 That’s why play therapist and counselor, Tracy Turner-Bumberry, LPC, RPT-S, CAS, has created 75 simple, playful and on-point interventions that combines mindfulness, expressive arts and play to help kids achieve greater self-regulation, focus more and stress less. Tracy Turner-Bumberry, LPC, RPT-S, CAS, is the owner/operator of KS Counseling, LLC. Tracy is a Licensed Professional Counselor, a Registered Play Therapist-Supervisor, a Certified AutPlay Therapist/Trainer, and a Certified Autism Specialist. She has over twenty years of experience working with children, adolescents, and young adults.